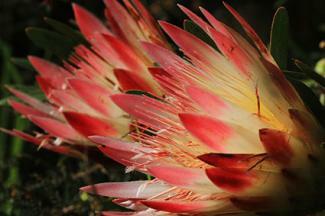 Proteas are effulgent flowers that challenge and delight even experienced gardeners. They have countless variations of splendid color and form, and they grace garden plots with their lasting, perennial beauty. Proteas (Proteaceae family) are named for Proteus, the ancient Greek sea god who was capable of changing his appearance at will, because of their many varieties of shape and color. Originating in South Africa and Australia, they have made a recent appearance in the United States as a dazzling addition to many gardens. According to SF Gate, protea shrubs can vary in height from 3 to 13 ft. The blossoms, too, are of many varieties, ranging in size from 2 to 12 inches wide and manifesting in many brilliant colors. Most are composite flowers, with lots of tiny blossoms surrounded by colorful bracts, making up what you see as one large flower. 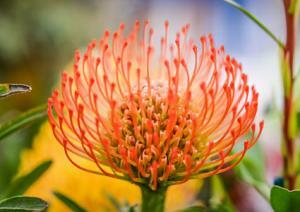 The Pincushion protea looks like an explosion of fireworks, with long, orange-red pistles supporting tiny petals. 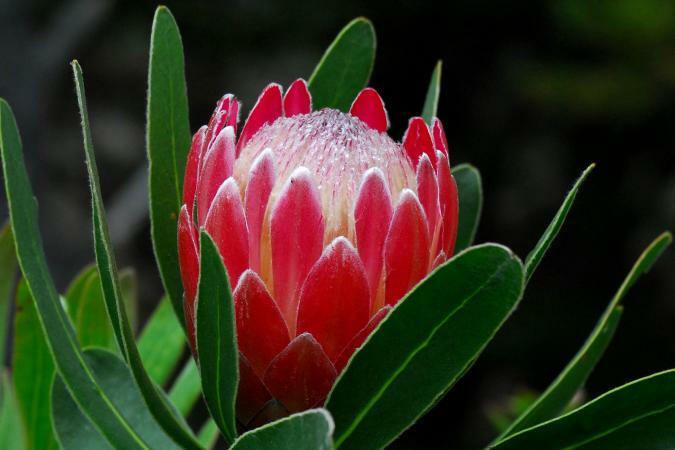 The King protea looks like a cup, with large pointed brackets holding a dense collection of petals. While the flowers come in many varieties, they are all united by their unique "proteoid" root structure, which looks like fine balls of wool and absorbs nutrients very efficiently, and are paired with a deep tap-root. Proteas generally grow best in USDA zones 8 through 11. According to California Protea Management, they prefer an open location with ample air circulation and full sun for at least six hours each day. They do best in acidic soil that is well-drained. Because the part of their root system that is responsible for the uptake of water and nutrients grows horizontally and close to the surface, they can "drown" if water pools around their base. They don't like to be overcrowded or to be in an environment with too much humidity. Proteas can be grown from seeds or from starter plants. Prepare the soil. SF Gate recommends an equal mixture of coarse sand and coco peat to achieve the perfect mix of water retention and drainage. Find out if your particular protea seeds require exposure to smoke to begin germination, and use a smoke primer if they do. Plant. After soil is prepared, plant each seed at a depth equal to its size. Water. Water well with a light sprayer. Make sure to keep the seed moist throughout this stage of its growth. Wait. Keep in semi-shade (use 30% shade cloth if available). Water consistently, but do not over water. Germination time is between one and three months. Once the first true leaves begin to appear, the seedlings can be exposed to full sunlight. Finding proteas at a nursery can save some time and effort and still produce gorgeous results. California Protea Management details the methods for selecting and planting healthy protea shrubs. Select the right plant. Plants that are in 4-inch to 1-gallon containers are the best sizes; the Government of Western Australia notes you should choose one with "well formed roots". Pick a plant with some new growth and healthy leaves. Dig a hole large enough for the plant. Try making it about three times the width of the pot that it comes in. If you wish to increase drainage in soil, add some organic material such as fir bark or forest peat. Put in the plant and fill in the hole, keeping the rootball just above the soil line. Pack the dirt in gently, then cover with an inch of mulch to keep the roots cool and discourage weeds. Do not pack mulch around the stem of the plant, as this can cause it to rot. Mulch and organic material is the best fertilizer. The Royal Botanic Garden of Sydney discourages other fertilizer use, as protea roots are adept at picking up nutrients from the soil and some fertilizers, particularly those with phosphorus or potassium, can harm the plant. While plants are still small, it is best to keep them in partial shade until their foliage is large enough to shade their own roots. Keep the roots moist for their first two years of life, but be careful not to over water. 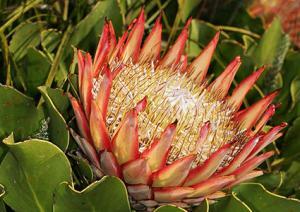 Proteas can withstand a wide range of temperatures, from around 23 to 100 degrees Fahrenheit. Once the plant has been established (after about 18 months, according to the Royal Botanic Garden of Sydney), decrease the frequency of watering, from twice a week to once every few weeks, depending on the type of protea, how hot it is and your soil type. After the first 12 months, proteas can be lightly pruned for shape. While pests are rarely an issue with proteas, there are a few things to watch out for while caring for them. Common issues and solutions for protea flowers include the following items. Mold may become an issue in places where humidity is high, but this can be prevented with good ventilation and not overcrowding the plants. Young proteas can be protected in a wire cage from animals like rabbits and deer. Groundhogs can destroy roots. To prevent this, plant surrounded by chicken wire. Make sure there is ample room for the roots to expand. The Royal Botanic Garden of Sydney discourages the use of fresh young mulching materials, which draw nitrogen out of the soil as they rot and create an environment that encourages harmful fungi. Instead, use wood chips. To avoid fungal infections, water in the morning rather than the evening, to ensure the ground doesn't stay too damp overnight. If it is difficult to find well-drained soil, try amending the soil and planting on a slope or a raised bed. Horticultural fleece can be used to protect the plant from cold during winters, especially during its first two years of life. Proteas are perfect for rocky or depleted soils; areas in your garden you may have trouble putting anything else. Over-pruning can damage proteas, however light pruning can cause more blossoms to form the next year and even increase the lifespan of the plant. To increase the acidity of your soil, try mulching with pine, oak or acacia leaves or bark. Make sure the water you are using to water your proteas is high-quality, especially when they are first starting out. Make sure your water is neutral or acidic (not alkaline) and that there is not a high content of chlorine or salt. Proteas are glorious and unique flowers. While they take some time and effort to start, they are hardy once established and create beautiful blossoms for many years to come. Enjoy this new addition to your garden!